• الموضوع : Cleric El Husseini met the Australian thinker and researcher Dr. Rodger Shanahan: Islamophobia is a fabricated phenomenon that must be confronted . 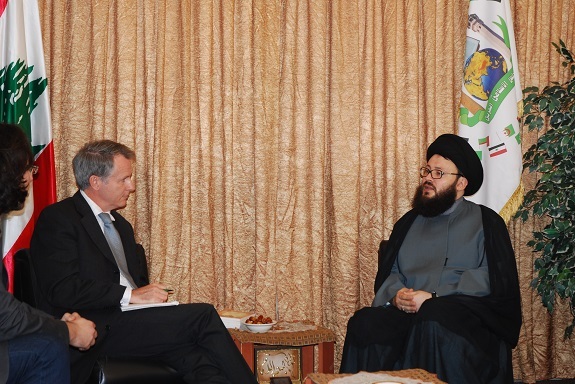 His Eminence Dr. Mohamad Ali El Husseini, Secretary-General of the Arab Islamic Council, received the Australian thinker and researcher Dr. Rodger Shanahan at the Council’s headquarters in Beirut and briefed him on developments in the Arab region. The meeting included an in-depth intellectual discussion on the phenomenon of Islamophobia and ways to confront it. Dr. El Husseini stressed that Islam is the religion of moderation, tolerance, openness and dialogue with the other. Prophet Muhammad (PBUH) has showed countless examples of the tolerance towards the peoples of other religions. This approach is the way we, at the Arab Islamic Council embrace and implement. El Husseini pointed out that Islamophobia is a fabricated phenomenon that must be confronted in a rational and wise manner. True Muslims are moderate in their thinking and refuse all forms of extremism regardless of its origin. Those Muslims are the ones who follow the path of the noble Prophet Muhammad (PBUH), a path of peace, love and tolerance and not the ones who unethically justify the assaulting, terrorizing and killing of people.